Happy New Year everyone! 2018 was a banner year for Comfort Quilts and I thank all who contributed to creating, piecing, quilting and managing fabric. Many hands and minds make beautiful quilts. 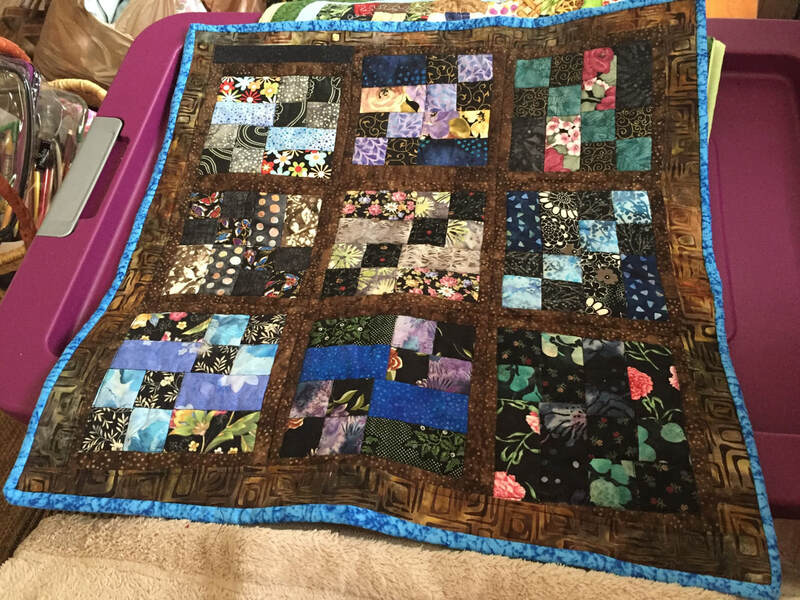 This past year members of our Guild produced a total of 130 quilts! This number exactly matches the number reported in 2017 and 2018. We certainly are consistent!! Eighteen personalized quilts were delivered to Spaulding students this year. This project continues to be one that is fun to do and very much appreciated by students and staff. We have recently received some lovely feedback about this project which we will share at the next regular meeting in January. We presented 16 bed-size quilts to women who graduated from the CORE program at the Belknap County Jail. These quilts are treasured gifts for these women. It is the first thing the new inmates hear about when they start the program. Every week they ask me about their quilt and when they will receive it! We are filling a void in these lives and I thank you very much for your support. year. The teddies were the frosting on the cake. If you do the math, you will figure out that there are still about 25 quilts left. They are wheel-chair sized. My committee and I will be looking for a place to donate these in the first months of 2019. Finally, the committee met recently and discussed ways to streamline and focus the Comfort Quilt Project. Stay tuned to meeting announcements and newsletter articles throughout the year as we begin this process. I am looking for volunteers to be in charge of specific projects. Let me know if you would love to join us. Each year we organize work sessions either to sew quilt tops from kits provide by the committee or to cut fabric to make more kits. These sessions are held at either the Spaulding Youth Center or the Taylor Community Woodside Building. The sessions are announced at the regular BMQG meetings and in the bi-monthly newsletters. At the August 2017 work session participants learned the Disappearing Hour Glass technique. In May 2018 the Split 9-patch technique was taught. These sessions provide both skill building and service opportunities. It has also increased the number of completed quilts donated! November and December. Thank you to the members who worked so hard to finish these quilts in time for the holidays! New quilt requests are still coming in. Currently we have four that are waiting to be adopted by a Guild member. New idea are forming to simplify the quilt requests. Stay tuned, as more information will be coming soon! If you have any questions regarding our Comfort Quilt Program. Please contact our Comfort Quilt Program Chair, Diane Orlowski.